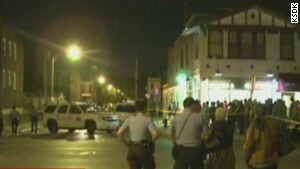 (CNN) -- Vonderrit Deondre Myers, a teenager who died in a police shooting, was struck by seven or eight bullets, St. Louis city Medical Examiner Dr. Michael Graham said Thursday night. "All but one gunshot wound were to the lower extremities," Graham said. "The one fatal wound was to the head." Police Chief Sam Dotson said the killing happened Wednesday evening when a suspect shot a pistol three times at the St. Louis officer, who was off-duty but wearing his uniform while moonlighting for a security company. The officer fired his pistol 17 times, police said. The shooting sparked angry street protests, with residents pointing out similarities to the August killing of Michael Brown in nearby Ferguson. Myers and Brown were both 18 and black and killed by white police officers. One big difference: Police said Brown was not armed. "It`s a clear case of this young man being gunned down by an insensitive white officer who was off-duty," Akbar Muhammad, part of a coalition seeking justice in the Brown shooting, told CNN affiliate KTVI. "He chased them off a corner." Were 17 shots excessive? St. Louis Police Officers' Association lawyer Neil Bruntrager discussed that Thursday night on "Erin Burnett OutFront." "When he uses deadly force he uses deadly force until the threat is gone," Bruntrager said. Bruntrager said without video of the incident or unbiased witnesses, the police and the public must rely on physical evidence. A 9mm pistol allegedly fired by Myers was found at the scene, police said. But Van Jones, a civil rights activist and CNN contributor, said nobody can trust the police after the Brown killing. "You're seeing a wholesale breakdown of trust," he said on "OutFront." Thursday night, St. Louis residents held a candlelight vigil for Myers at a sandwich shop where he bought food shortly before being shot. They sang hymns, prayed and released balloons into the air. Speakers urged the people to remain peaceful. "The chief did an outstanding job yesterday, keeping the tension down between the police officers, as well the protesters," Missouri state Sen. Jamilah Nasheed of St. Louis said to KTVI. "It is an unfortunate situation. My heart goes out to the family, but again from what I am hearing it was a direct correlation to racial profiling, racial profiling went deadly." The Myers shooting occurred just ahead of a "Weekend of Resistance" in St. Louis, where activists will push for movement in the investigation into the Brown case. An animated crowd quickly gathered late Wednesday near the shooting site close to the Missouri Botanical Garden, chanting slogans as St. Louis police officers stood by. Despite the tensions, Dotson said no businesses were looted and no windows were smashed. He praised officers for showing a "tremendous amount of restraint" as members of the crowd confronted them face-to-face and damaged three police cruisers. CNN affiliate KMOV reported that a post office was damaged. The officer, a six-year veteran who has not been named, was placed on administrative leave. Bruntager said he served two tours of duty with the military in Iraq and was awarded a Bronze Star and a Purple Heart. While on patrol, the officer saw three black males run away as he approached, Dotson said. He gave chase because one of them was holding up his pants in a way that made the officer believe the teen may be carrying a gun, Dotson said. Online court documents show Myers was arrested June 27 and charged with unlawful use of a weapon, a felony, and resisting arrest. He'd been released on bond. A hearing scheduled for Monday had been postponed, with the next hearing on November 17, the documents show. A man describing himself as the owner of Regal Foods in St. Louis, but who didn't want to give his name, told CNN in a phone interview that Myers was in his store before the shooting. Myers was wearing a T-shirt, the store owner said, adding that he didn't see a gun. The teen bought a sandwich and left. He was shot across the street from the store about 10 minutes later, he said. Myers' cousin, Latara Franks, said another cousin, her brother and a family friend were with Myers, and they confirmed to her he purchased a sandwich at a corner store shortly before the shooting. "He got in trouble with police, but he went to school and work," Franks said of Myers. "I can't believe they did him like this." CNN's Shawn Nottingham, Eliott C. McLaughlin, Dave Alsup, Tony Marco, Bill Kirkos and Dana Ford contributed to this report.